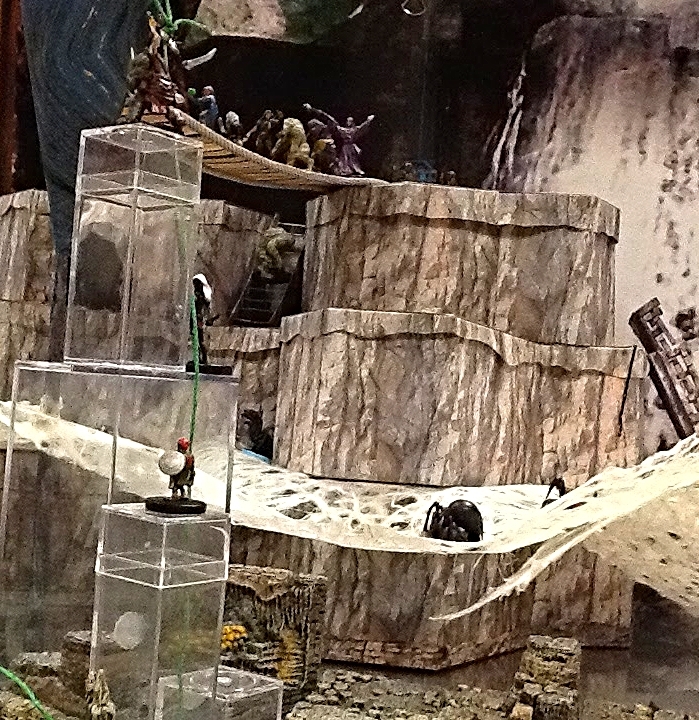 Staring January 2016, I (OldSchoolDM) started running D&D 5e’s “Out of the Abyss”https://dnd.wizards.com/products/tabletop-games/rpg-products/outoftheabyss at Games of Berkeley. The next few posts will log that adventure. Those are the first words you hear when you wake up with a terrible headache and feeling quite sick. You are disoriented and being dragged into a large dark cavern. You feel the cold stone beneath your bare feet – and notice you are wearing nothing but your underclothes. 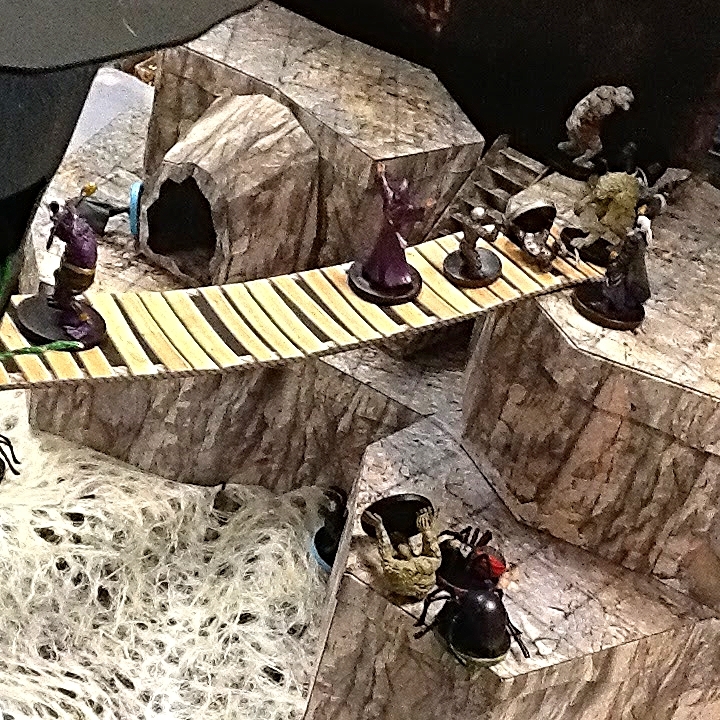 At two day intervals, the characters arrive at the Velkynvelve crevasse somewhere deep in the Underdark. 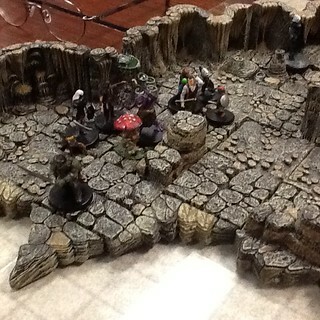 Captured by the drow! You wouldn’t wish this fate upon anyone, yet here you are – locked in a dark cave, the cold, heavy weight of metal tight around your throat and wrists. You are not alone. Other prisoners are trapped in here with you, in an underground outpost far from the light of the sun. 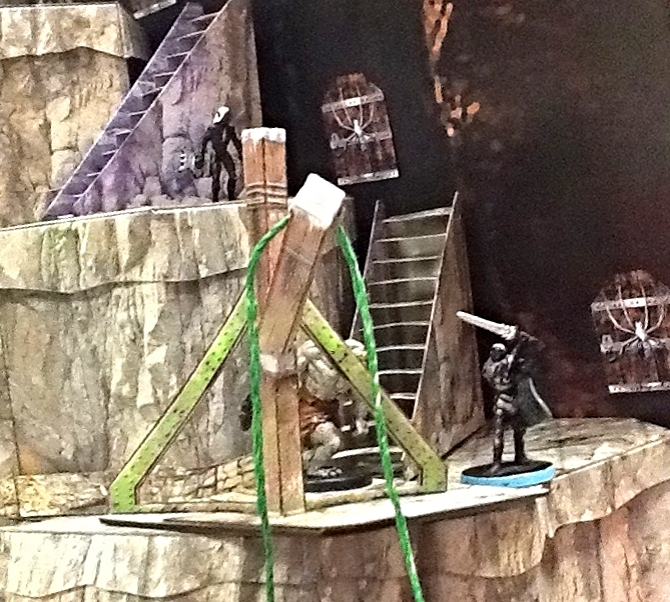 Your captors include a cruel drow priestess who calls herself Mistress Ilvara of House Mizzrym. Over the past several days, you’ve met her several times, robed in silken garments and flanked by two male drow, one of whom has a mass of scars along one side of his face and neck. Mistress Ilvara likes to impress her will with scourge in hand and remind you that your life now belongs to her. “Accept your fate, learn to obey, and you may survive.” Her words echo in your memory, even as you plot your escape. In turn, they are tossed into a rough hewn cell, occupied for more than 10 other prisoners. An odd assortment of Drow, Orc, Dwarf, Derro, Svirfneblin, Kuo-Toa, Quaggoth, and Myconid. 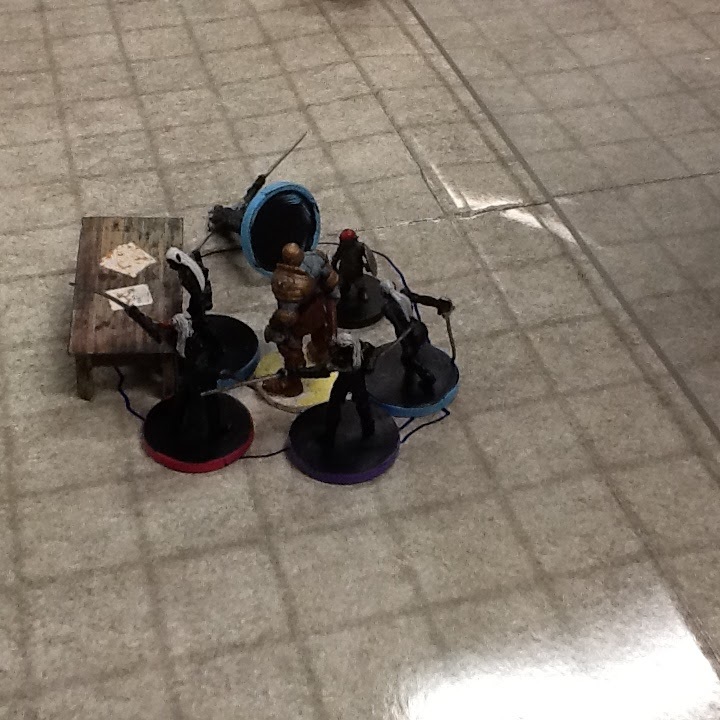 Into that mix was added a Female Drow Paladin: Magda, Half-Orc Fighter: Kraum, Half-elf Cleric: Darvon, Elf Rogue: Bucephalus, and a High Elf Wizard: Adrian. With such a diverse and crowded cell, communications was difficult (though most of the newcomers spoke elvish) – for the rest, staying close to Stool – the Myconid allowed them to communicate through telepathic spores. Progress was slow as the party was put to work on menial tasks by their cruel captors, cleaning chamber pots and moving rocks all while under watch, though this did give our three remaining heroes a chance to make buddy-buddy with some of the other prisoners, earning trust and fourth wall breaking rewards. Things took a turn for the worst during the night, however, as the moody Drow prisoner, Sarith Kzekarit arose from his slumber and attacked Magda, attempting to strangler her before being pulled off of his would be victim by everyone’s best friend, Kraum. He appeared to be suffering from some kind of psychosis compelling him to murder, which was temporarily cured with a kiss of forgiveness delivered by Magda. Rations at this point were becoming less and less substantial, and starvation became the major concern of the group, we had to escape soon or perish. 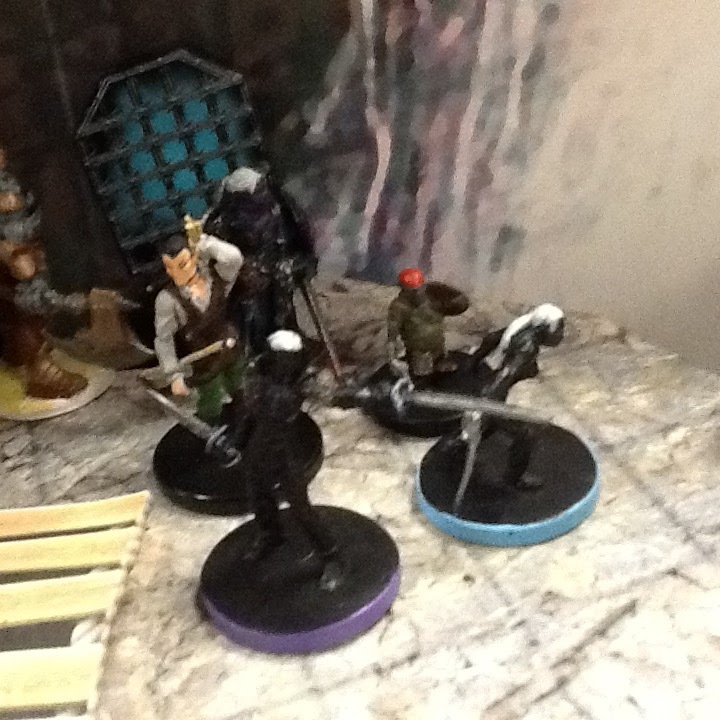 Kraum, in an effort to distract the guards, challenged the other Orc in the cell to a fight while his pals checked out the strength of the cell door and lock. 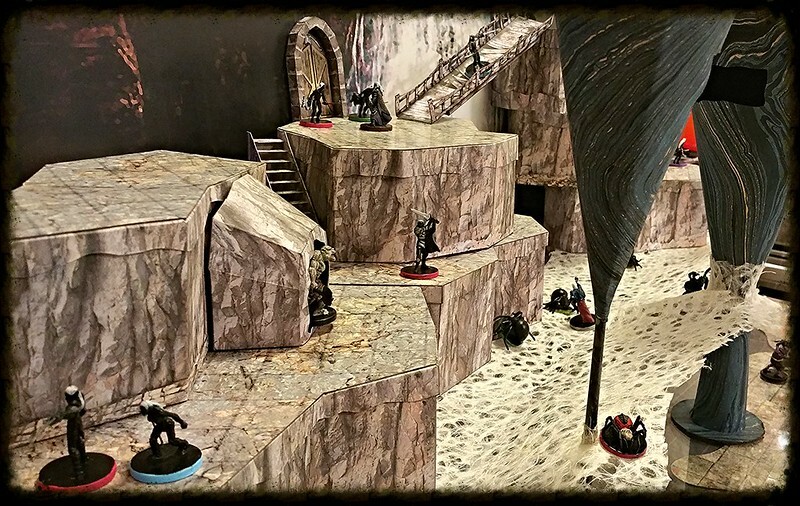 Despite his mixed blood, Kraum managed to best the larger Orc, swiftly dodging several punches before landing the final blow, sending the oaf spiraling towards the ground. 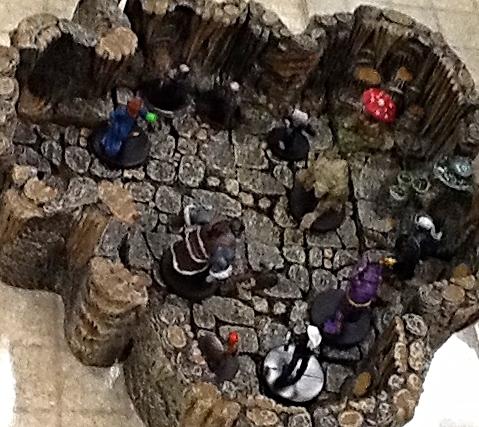 With the info gathered by the other prisoners during the fist fight and using the excessively loud proselytizing of Brother Darvon for cover, the party managed to break out during the night (or whatever they have in the Underdark), taking out several guards. 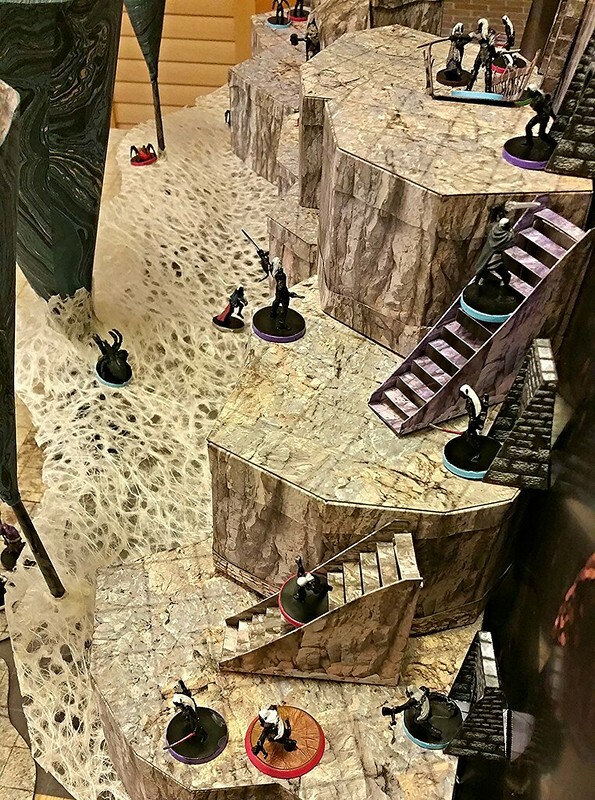 - and straight into an elite Drow who managed to take down Magda before finally being brought down himself with a poisoned arrow. Climbing up inside the stalactite, the Madga, Jimjar, Kraum, and Sarith discover that the armory is full of armor, and various weapons. They quickly slip on some cover, and grab a weapon or two. 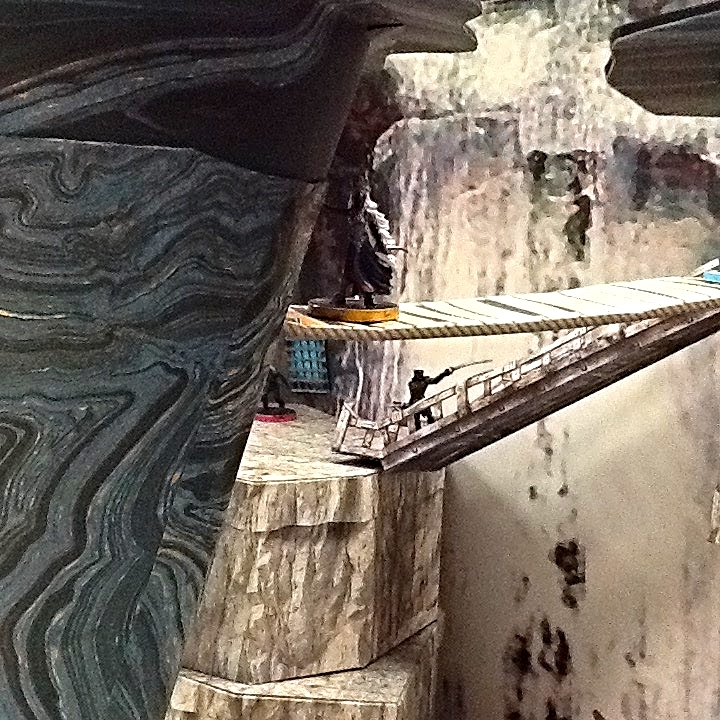 Sarith and Jimjar tie one of the four long silk ropes to the table and drape it out and down to the canyon floor. No sooner is it set, they start climbing down. 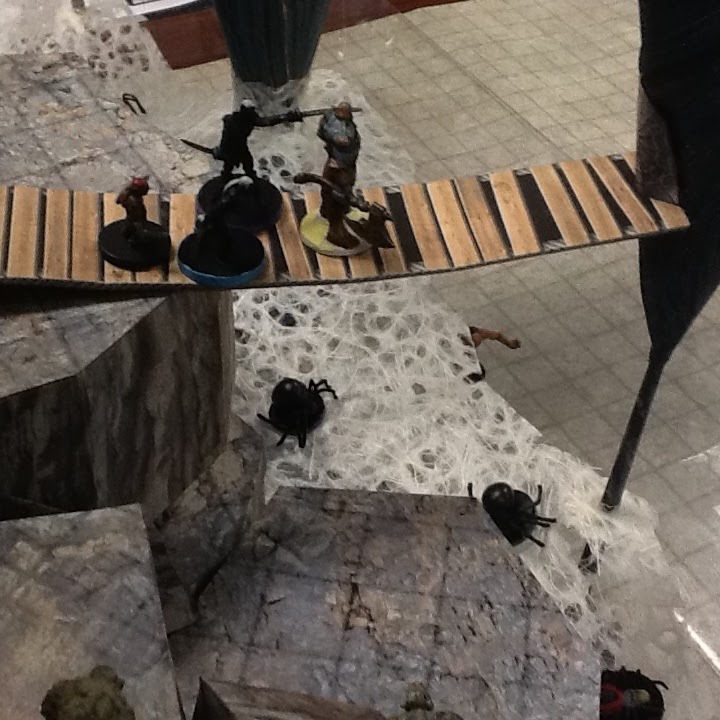 The Bridge Sabotage made a lot of sound, so the Drow now know that something is happening! 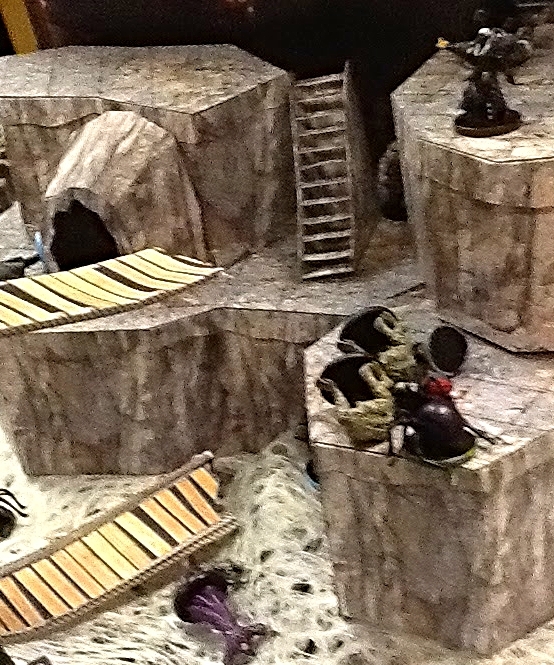 There are several casualties on both sides, but the outpost guards closest to their exit are quickly dispatched. Adrian, Topsy and Turvy are the last to reach to gangway. Though most of the other Drow are trapped with no way to get to the escaping prisoners, not so for Shoor Vandree, Ilvara’s lieutenant and lover. He uses a wand that shoots webbing to create a personal bridge to get to the prisoners. As a Quaggoth strikes Turvy down, Shoor fires his wand again, this time immobilizing Adrian. And cuts the very gangway he’s kneeling on! 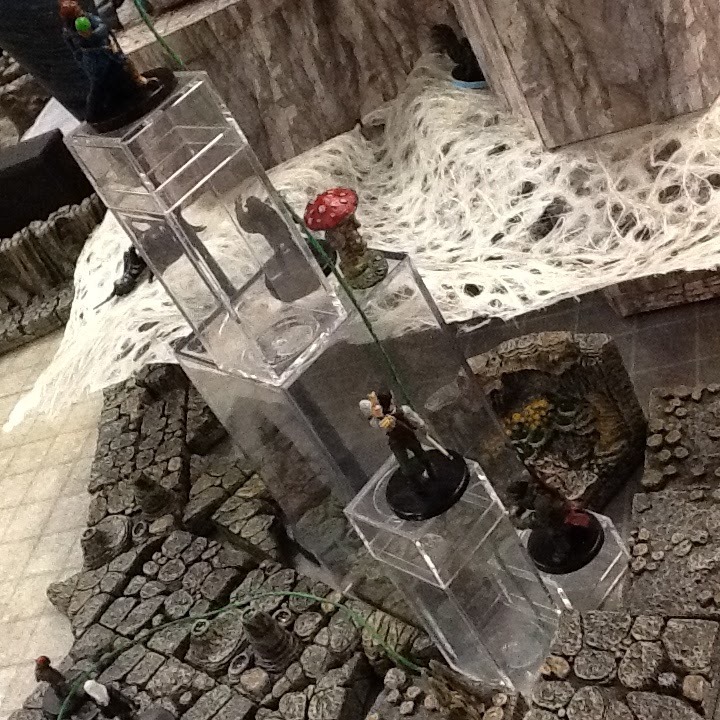 Sending another Quaggoth, Adrian, and himself to plunge to their deaths! Shoor uses another charge of his wand to save himself by swinging back to the cliff top – with no charges left to give chase. 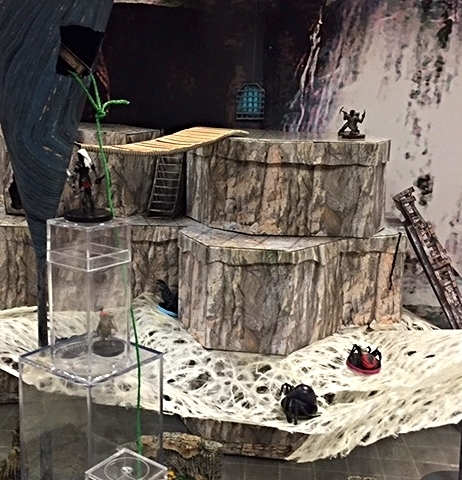 Quickly each survivor grabs some armor and a weapon, and descends to the floor – running full speed to the no-longer guarded cave exit. 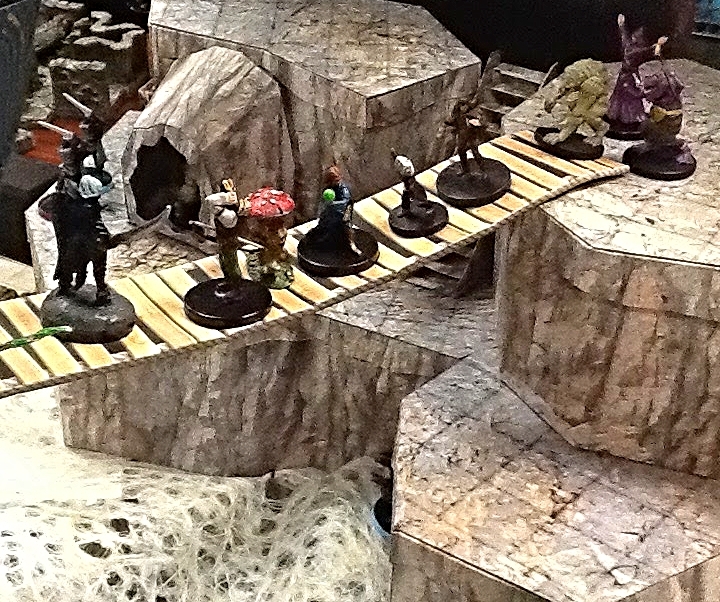 Loud screams of anger and disappointment ring above the decreasing sound of Velkynvelve Falls as the party disappears from her view and out of the canyon. Theey buy a enough time to equip by dropping bags of caltrops (that they picked up in the armory) at various chokepoints as the run headlong into the dark. Map: Water map from Paizo covered with hand-made tiles using a standard Fat Drgaon dungeon floor texure. Stalagtites: Hand made with chopsticks, plastic bases, and hand-rolled cones covered with art paper. Etc. : Several single props by other designers. AWESOME SETUP!!!! Really cool I love it. Haven’t read this yet but just looked at the pictures – will be coming back when I have time. Thanks! And thanks for the follow.